This Means War! by Ellen Wittlinger. Simon & Schuster Books for Young Readers. April 2010. Reviewed from Advance Reviewer Copy from publisher. Juliet, ten, has lost her best friend, Lowell. Why? Because Juliet is a girl. Six years of friendship mean nothing, now that Lowell is friends with Tommy and Mike. Boys do boy stuff, she is told, and girls do girl stuff. GO. AWAY. is the message. Patsy, Juliet's new friend, isn't afraid of anything. Or anyone. One thing leads to another, and suddenly the boys and girls are challenging each other to see who is better, faster, stronger, braver. No matter the risk. No matter who gets hurt. This fifth grade battle of the sexes plays out in October 1962, against the backdrop of Cuban Missile Crisis. Wittlinger lets the reader connect their own dots about the motivations and fears of the various kids and parents. 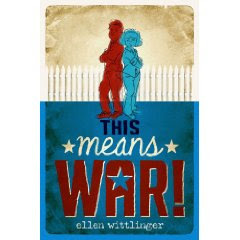 This Means War is not just about the war between two groups of fifth graders; it's the war against prejudices, against fear of change, against the unknown, against oneself. Sounds GREAT! Thanks for the heads up.